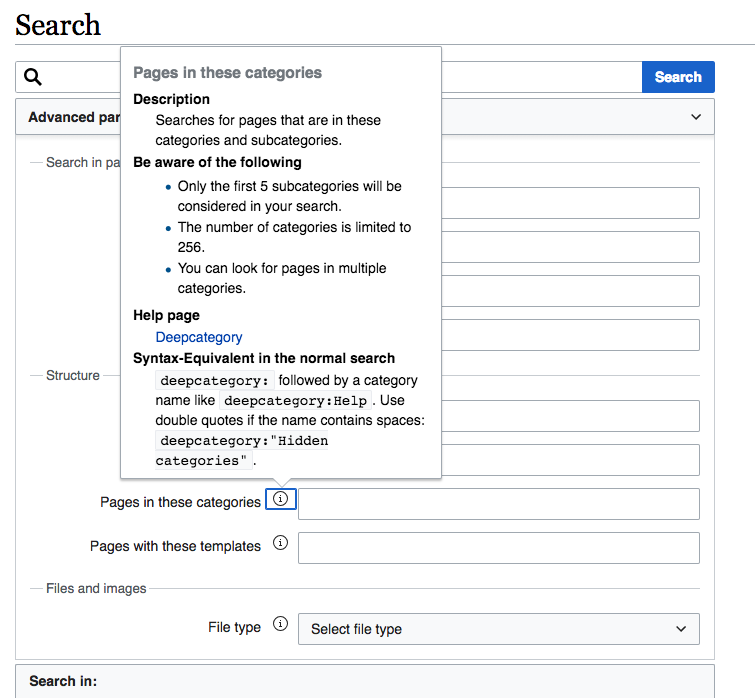 Currently, the explanation of the deepcategory keyword is misleading: It suggests that only 5 subcatagories will be searched through, whereas it actually searches through 5 subcategory levels. See the first bullet point below "Be aware of the following"
I was trying to figure out how the "Pages in these categories" search operates, so read the pop-up Help panel (see screenshot below). The instructions say "Only the first 5 subcategories will be considered in your search." I debated the meaning of this with colleagues in the office; most thought it meant exactly what it says—that only 5 subcategories will be included in the search. 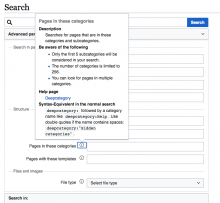 However, a look at the Help doc for Searching Wikipedia makes clear that that is not the meaning. The doc says "The depth of the tree is currently limited to 5 levels" [emphasis added]. To make the help panel clearer for English speakers, I suggest you change the wording as follows: "Only the first 5 subcategory levels will be included in your search." Lea_WMDE moved this task from Backlog to Tickets ready for pickup on the Advanced-Search board. Tobi_WMDE_SW added a project: WMDE-FUN-Sprint-2019-03-04. CorinnaHillebrand_WMDE added a subscriber: CorinnaHillebrand_WMDE.